Tests carried out by a leading forensic scientist have cast doubt on the murder conviction of an Ipswich man, a BBC documentary has revealed. Simon Hall, 29, from Ipswich, was jailed for life in 2003 for murdering Joan Albert, 79, of Capel St Mary. The key evidence against Hall were fibres linking him to the crime scene. But Dr Peter Bull found if they had been worn by the killer, who entered through a broken window, they should have contained glass but did not. Dr Bull, who first talked about the case to BBC News Interactive in 2005, tells a BBC Rough Justice documentary, that new experiments suggested that if someone had smashed the window to get through they would have had fragments ingrained in their clothing. The Oxford University scientist says the lack of glass particles casts a doubt on the key evidence against Hall, whose case is now being investigated by the Criminal Cases Review Commission. 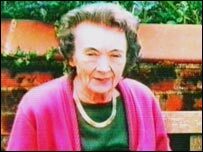 Mrs Albert was murdered in the early hours of 16 December 2001. Hall had been out drinking with friends in Ipswich and had an alibi for most of the night and early morning, except the period between 0530 and 0615 GMT. The prosecution contended that after driving to a house to drop a friend off in Ipswich, Hall then drove to Capel St Mary and parked his car close to Mrs Albert's home. At his trial, the jury was told fingerprints, footprints and DNA evidence found at the murder scene did not match Hall's. But detectives believed fibres from black trousers found at the scene, in his car and in a cupboard at his parent's home, tied him to the murder. This is disputed by Hall's family, who say he never wore such trousers and was wearing blue ones on the night of the murder. The documentary, due be shown at 2235 BST on Thursday, will look at how Bristol University students are gathering evidence on the case. 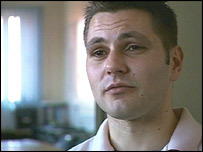 The students are part of the Innocence Network, a national organisation which looks at possible miscarriages of justice. Dr Michael Naughton, a co-ordinator of the Network, said: "From what we have seen so far the students have no doubt whatsoever that he should not have been convicted on the evidence said in court. "The evidence against him was so unreliable." Barrister Keir Starmer QC tells the programme: "Simon Hall's case is really peculiar because there is no particular reason to believe he is guilty of this offence. "The one crucial link is the fibre evidence. Break this and the case disappears." Campbell Malone, Hall's solicitor, told BBC News: "I think there are already serious doubts about the safety of his conviction. "It is regrettable it is such a slow process to reopen the case." Hall's mother Lynne welcomed the new documentary. "I think the film has a powerful image of Simon's dilemma in having to fight a system that doesn't allow or recognise miscarriages of justice... plus it begins to show the faults and cracks in the evidence that convicted him," she said. Stephanie Bon, a spokeswoman for the Justice4Simon campaign, said: "We hope that it will help raise Simon's profile as well as the fact that miscarriages of justice happen everyday and to anyone." Suffolk Police said it would not comment on whether officers had seen the documentary. "Simon Hall was found guilty by a jury at Norwich Crown Court of the murder of Joan Albert and sentenced to life imprisonment," said a police spokesman.